Precentor of Christ Church Cathedral and Rector of Stillorgan. period we have scanty records. maintained by the Monks of St. Mary’s Abbey, Dublin. tion with St. Brigid or her Monastery at Kildare. to the well near the Rectory and Church. present to be seen at old Tully Church. This points to an early date for St.
but Athnakill or Acranakill. This would seem to show that the Church of St.
Brigid was there before the name Teachlorcan arrived. of his Patron Saint, Brigid of Kildare. Island, which are amongst the oldest church ruins in South Dublin. had of what a church should be. were erected great buildings such as we see in Christ Church Cathedral, St.
Patrick’s, and St. Canice’s, Kilkenny. 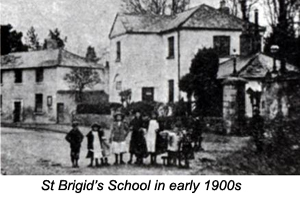 It was at this time that we first have mention of Stillorgan in history. the stream. These buildings were, no doubt, near where the Church stands. as it is now usually called. status to Stillorgan Parish, also brought special dangers and sore trials. Jerusalem under Nehemiah, they had to use the sword and the trowel together. came from England taught new ideas concerning tillage. The Monks of St.
name by which we know the district now—Dean’s Grange, the Dean’s Farm. in Co. Wicklow, and became possessed of much substance. He died in 1609.
with seven hearths, another house with two, and 18 cottages. church, till it fell into ruins, was larger that in Celtic times. building may be of later date than Cromwell’s time. James II. he retired to Chester, only to return after the Battle of the Boyne. which are now known as the Carysfort Estate. house and gardens in the words of Elrington Ball. who was the principal rural artist in Ireland in the reign of Queen Anne. and sculptured figures apparently designed on some classic model. the good Archbishop King and a host of others. “ Thither went Mrs.
Castle. These two great houses had no compeers in South Dublin. Carysfort, Lord Lifford, Nicholas de Fevre, Mr. John Verschoyle, and Mr. Kill, Tully, Dalkey, and Killiney. the building in 1812, thus completing the building as it now stands. The Registers of Monkstown Parish had previously been edited by Mr. In 2013 we celebrated the 300th Anniversary of the oldest building in Stillorgan, the Parish church built in 1712. Since then we have embarked on a project to identify other old buildings and to tell the story of the "big house" and the families that lived in them. If you have information/photos of Stillorgan that you would like to share, please contact us.